The Word Gaebyeok (개벽 開闢) comes from the Korean expression Chongae Jibyeok (천개지벽 天開地闢), Chongae (천개 天開) meaning “heaven opens” and Jibyeok (지벽 地闢) meaning “ earth opens” Later, it has been called chunji-gaebyeok (천지개벽 天地開闢). Originally, chunji-gaebyeok means that heaven and earth are born from the ocean of life. Gaebyeok (개벽 開闢) is often translated as “renewal,” “transformation,” or “a new beginning.” In Jeung San Do, gaebyeok (개벽 開闢) signifies a transformational renewal of myriad manifestations: a renewal of heaven and earth; a renewal of civilizations; a renewal of a person’s body, mind, and spirit. 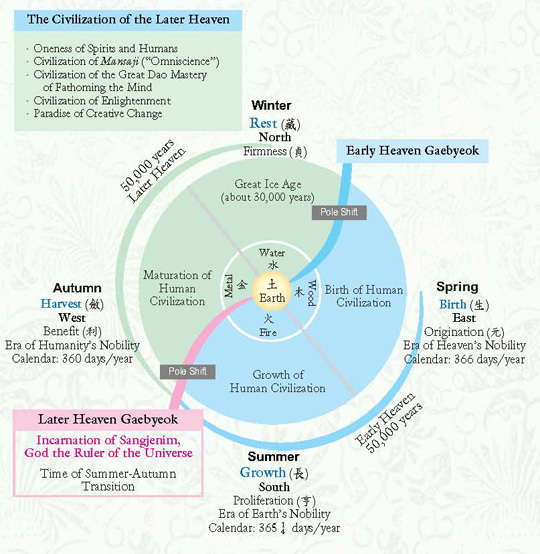 A Gaebyeok is a transition between seasons during the cosmic year, which spans 129,600 calendar years. In cosmology of Jeung San Do, gaebyeok is the epochal transition between cosmic seasons, the two foremost such transitions being the Early Heaven Gaebyeok (the transition from the cosmic winter to the cosmic spring) and the Later Heaven Gaebyeok (the transition from the cosmic summer to the cosmic autumn). In Jeung San Do’s teaching, Gaebyeok is a transition between seasons during the cosmic year, which spans 129,600 calendar years. Since the transition to the Early Heaven also marks the transition from cosmic winter to cosmic spring, it also bears the name “Spring Gaebyeok.” Similarly, the Later Heaven Gaebyeok coincides with the Autumn Gaebyeok, and hence these two terms-Later Heaven Gaebyeok, Autumn Gaebyeok- signify the same momentous epoch. And above all other gaebyeok looms the ultimate of all renewals : the Autumn Gaebyeok, the onrushing and imminent epochal transition between cosmic seasons that shall renew the three realms of heaven, earth, and humanity. Gaebyeok signifies a transformational renewal of infinite manifestations: a renewal of a person’s body, mind, and spirit; a renewal of civilizations; even a renewal of heaven and earth themselves. The most significant of these transitions is the Autumn Gaebyeok, which occurs between the cosmic summer and cosmic autumn. For humanity, it is about the wisdom of “How to adjust to constant changes and prepare for the major crisis occurred by environmental changes.” In this new age, humanity’s ascendance as enlightened beings shall bring to pass the Paradise of Immortality on earth. the beginning of the world more than the ending of the world. Through the universal principle of Gaebyeok, we can understand how the universe first opened, how it started to have its own order of time, and how it began to have a direction in its change. By understanding such an opening and the direction of time, and the cycle of cosmic year, Jeung San Do presents the principle of the changing universe. Within the word Gaebyeok, it contains at least ten different meanings. In general it means “to be opening up a new time”, but it also explains the process of opening up this new time as well as the resulting state of this new time. The word Gaebyeok originally comes from Chunji – Gaebyeok’ which means “to open up the Heaven as well as to open up the Earth.” So it literally means “to be opening up a new structure, a new principle, a new order, a new organization for a new universe.” As the universe opens up and brings forth a new structure, humanity understands and learns from it. To say it again, within our universe there is Heaven, Earth and humanity; and for they to be beginning a new life altogether, all along together, all at the same time, it is to be Gaebyeok-ing, this is what Gaebyeok is.